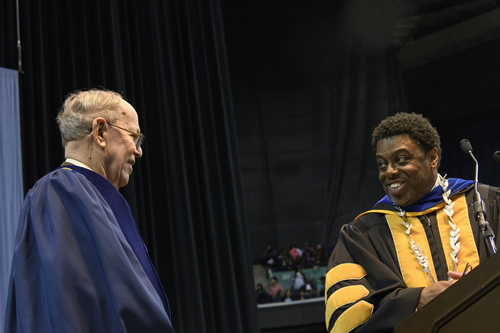 During UNCG's May 2016 graduation ceremonies Chancellor Franklin D. Gilliam Jr. presented the honorary Doctor of Letters degree to Harold Schiffman. The ceremony was held in the Greensboro Coliseum where approximately 2,500 students "turned their tassels" (full story). Harold Schiffman and Chancellor Franklin D. Gilliam Jr. 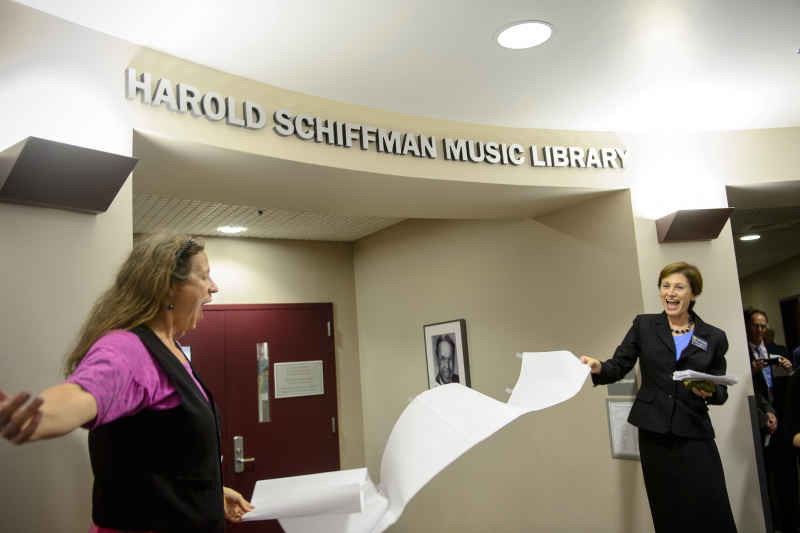 In a ceremony on October 5, 2012, the University of North Carolina at Greensboro renamed their music library the Harold Schiffman Music Library. During the ceremony the University Chamber Singers under the direction of Professor Welborn Young performed Schiffman’s Ballads and Lyrics (2012) on texts by north Georgia poet Byron Herbert Reece. 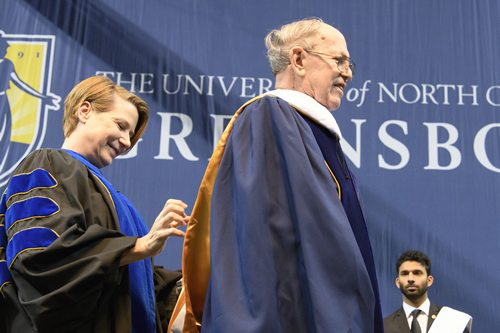 Also, the unveiling of the new name, by music librarian Sarah Brooks Dorsey and Dean, University Libraries Rosann Bazirjian, was heralded by the composer’s Fanfare (1981) played by the UNCG Brass Ensemble directed by Dennis Askew. Also speaking on the occasion were Chancellor Linda P. Brady and Sue Stinson, Interim Dean, School of Music, Theatre and Dance. The University of North Carolina at Greensboro has announced the renaming of its Music Library to become The Harold Schiffman Music Library. A renaming ceremony will take place in the fall of 2012. Although Schiffman is a Greensboro native, he is not an alumnus of UNCG. When he was of college age, what is now UNCG was the Woman’s College of the University of North Carolina (WCUNC), so he was ineligible to matriculate there. Nonetheless, he often visited the Woman’s College campus, possibly not always for musical purposes, while in high school and later as a student at the University of North Carolina-Chapel Hill. He frequently attended concerts at WC, and he benefitted from the Arts Forums there in the 1940s and 1950s. 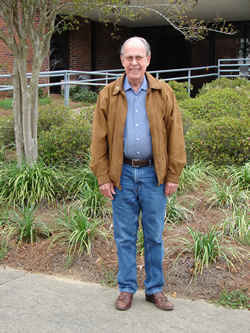 In recent years he has maintained a strong relationship with the University Libraries which established his archive in the Walter Clinton Jackson Library. Further, an anonymous donor established the Harold Schiffman High School Composition Competition in the School of Music, Theater, and Dance. Kaitlyn Wagner, a high School senior from Pinehurst, North Carolina, is the most recent winner of the Harold Schiffman High School Composition Competition scholarship at the University of North Carolina at Greensboro School of Music, Theater, and Dance, an award open to any graduating high school student in North America whose compositions are deemed by the UNCG School of Music's composition faculty to be deserving of the award and the monetary stipend accompanying it. A gifted young composer, Miss Wagner is also a violinist. A recorded performance of Harold Schiffman's Serenata Concertante (2009) is now available and indeed heralds the contents of North/South Consonance, Inc.'s newest recording, N/S R 1057: Concertante: Music for Chamber Orchestra by American Composers. Given the quality and appeal of the four-movement Schiffman composition, it can come as no surprise that the name of the CD itself is derived from the title of Schiffman's work. 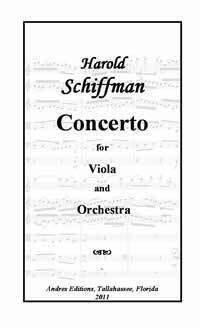 When writing this work, Schiffman took into account the high quality of the performers comprising the North/South Chamber Orchestra, and of the conductor of that orchestra, Max Lifchitz. 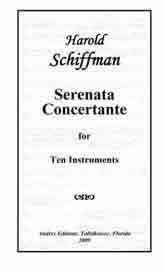 Therewith Schiffman took advantage of each performer's skills and thorough musical sensitivity -- qualities that are clear throughout their recording of Serenata Concertante (2009). Likewise, Schiffman's own qualities demonstrating both skill and musical sensitivity are evident throughout the composition from the opening "Andante" through the closing "Omaggio II: Andante e gioioso." 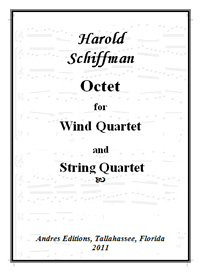 It is significant that it was at Max Lifchitz's request that Harold Schiffman undertook to compose this work for combined wind quintet and string quintet. Too, this work is designed and written to celebrate the thirtieth season of North/South Consonance, the ensemble that Lifchitz both created and then has directed throughout its highly applauded existence. One cannot overlook the fact that those thirty seasons of North/South Consonance have offered and do offer, free of charge, superb performances of mostly new compositions (such as Schiffman's contributions) written and performed to serve a wide and highly interested audience in New York City and surrounding areas. The full house the evening of November 4, 2011 -- one and all -- in the recently and beautifully remodeled Jean Pittman Williams Recital Hall of Mississippi College, in Clinton, MS, greeted the performance of Harold Schiffman's Extravaganza with more than mere enthusiasm! 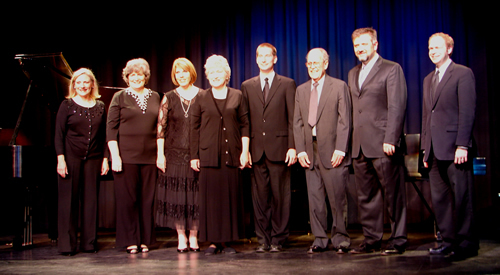 It was performed by truly distinguished pianists as part of The James S. Sclater Chamber Music Series at Mississippi College (a series that this season runs from September 2011 through March 2012). Indeed, the full program demonstrated the musical skill and talent that represent the faculty and student body at Mississippi College, evidence of which appeared throughout the concert, opening with J. S. Bach's Fifth Brandenburg Concerto (BWV 1050), followed by Antonio Vivaldi's "Laudamus te" from his Gloria (RV 589). Thereafter were programmed two vocal works by George Frideric Handel: "Fronde tenere e bella -- Ombra mai fu" from Serse, prior to Handel's "Tornami a vagghegiar" from Alcina. The Handel works led to Beethoven's Sonata for Violin and Piano, op. 12, no. 3. Making a rousing conclusion to the concert was Harold Schiffman's Extravaganza for Three Pianos, Twelve Hands, that brought the house down as the grand finale! Harold Schiffman’s latest work, Octet (2011), was completed on September 27, 2011. The three movement, twelve minute work is scored for a mixed ensemble consisting of flute, oboe, clarinet, bassoon, two violins, viola, and violoncello. It is dedicated to Leah Jones, a very dear friend, and a sort of honorary granddaughter to the composer and his wife, Jane Perry-Camp. 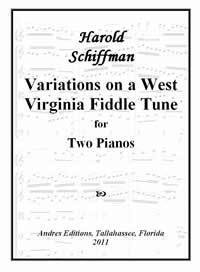 Harold Schiffman has just completed a new composition for two pianos titled Variations On a West Virginia Fiddle Tune (2011). The work was inspired by the return from total restoration of his beloved 1927 Mason & Hamlin grand. 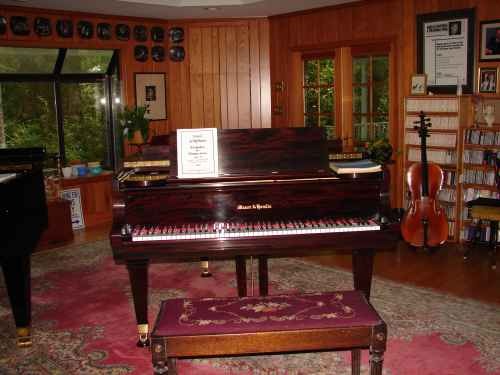 The M & H lives alongside Jane Perry-Camp’s equally beloved Bösendorfer concert grand. 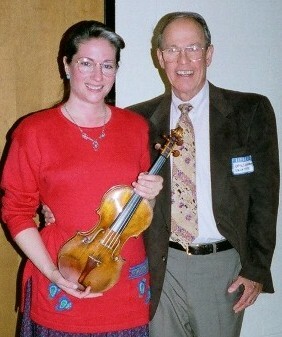 Schiffman learned the theme for the variations, “Over the Waterfall,” from folklore scholar and fiddler Alan Jabbour who in turn learned it from West Virginia fiddler Henry Reed. According to Jabbour, “The tune is an old British tune with an elaborate history, both as an instrumental piece and as the tune for an old ballad.” It has had a number of different titles including “Eggs and Marrowbones.” Under that title it had a rather interesting set of lyrics. The composition itself consists of the theme and six variations. At last, the sonorous rich and flexible tones of the featured viola are central to one of his concerti. In a sense, with the addition of the Concerto for Viola and Orchestra (2011), Schiffman's concertos highlight, one by one, all the instruments of the traditional String Quartet -- as well, of course, as highlighting elsewhere a great variety of other instruments and other traditional instrumental ensembles. 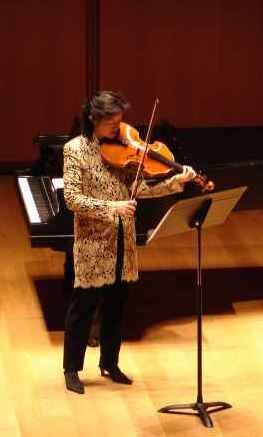 Violist Ah Ling Neu can be heard performing Schiffman's Fantasy-Suite for Solo Viola (1980), available on the CD Harold Schiffman at 80! (North/South Recordings N/S R 1053). 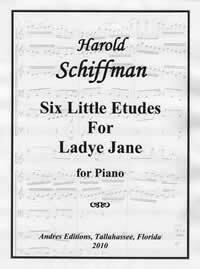 After a nine-year hiatus from writing for solo piano, Harold Schiffman has added Six Little Etudes for Ladye Jane (2010), for piano, to his musical oeuvre, wherein the title's word "Little" points to the etudes' collective performance time of approximately 9 minutes. The etudes all combine melodies with rhythms and harmonies that are interesting, sometimes unexpected, but never outrageous. In that sense, they are as much a study of composition techniques and the combinations thereof as they are studies in physical piano technique. This is not to say that there are no challenges for the pianist technically, challenges that serve to enhance the music's character. Indeed, as is appropriate to the genre, each etude addresses a different element of a pianist's technique. Overall, it is the subtlety of the music that offers the performer the greatest challenge: never to underdo and never to overdo, all the while respecting a variety of inflections, articulations, phrasings, melodies, and rhythms -- all typically set counter to one another, thus in counterpoint with one another, readily challenging the performer to treat each element of each voice appropriately, as is characteristic of contrapuntal writing. The six separate short ("little") pieces, offer a combination of ideas and moods, gathered into a unit wherein variety enhances unity. As implied, these etudes are not designed to replace the technical pianistic challenges in the manner of the etudes by Liszt, Chopin, Bartók and so many others, although they are not void of pianistic challenges so that the pianist can well expect to encounter some such challenges. All in all, a gifted younger student could well enjoy gaining, both technically and musically, from these etudes. 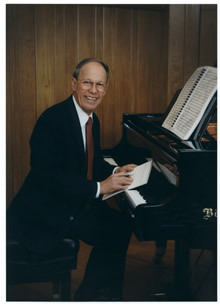 As he has other compositions for piano, Schiffman dedicated Six Little Etudes for Ladye Jane (2010) to his wife, pianist Jane Perry-Camp, with the reference, "for Ladye Jane," resuming the model already set in his "Spectrum, My Ladye Jane´s Booke: Eighteen Fugues and Postludes for Piano (1992)." The University Libraries at UNCG announce the launch of two new digital collections of manuscript materials relating to music, both the result of gifts by composer Harold Schiffman and Jane Perry-Camp. Jennifer Motszko, manuscripts curator at the University Libraries, notes, “"Dr. Schiffman is a great patron of the arts and a strong supporter of the University Libraries' digital projects." Harold Schiffman has composed in virtually all media. 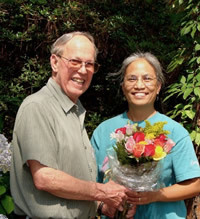 His commissions include those from such diverse groups as the Tallahassee Symphony, the International Trombone Association, the Apple Trio, the Concertino String Quartet, the Mallarmé Chamber Players, and the University of North Carolina at Greensboro School of Music, as well as from a number of individuals including conductor Richard Burgin, flutist Albert Tipton, soprano Janice Harsanyi, pianist Jane Perry-Camp, and pianist/conductor Max Lifchitz (for North/South Consonance). 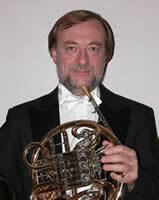 The North Carolina Symphony and the ARTEA Chamber Orchestra of San Francisco, among others, have premièred his music. 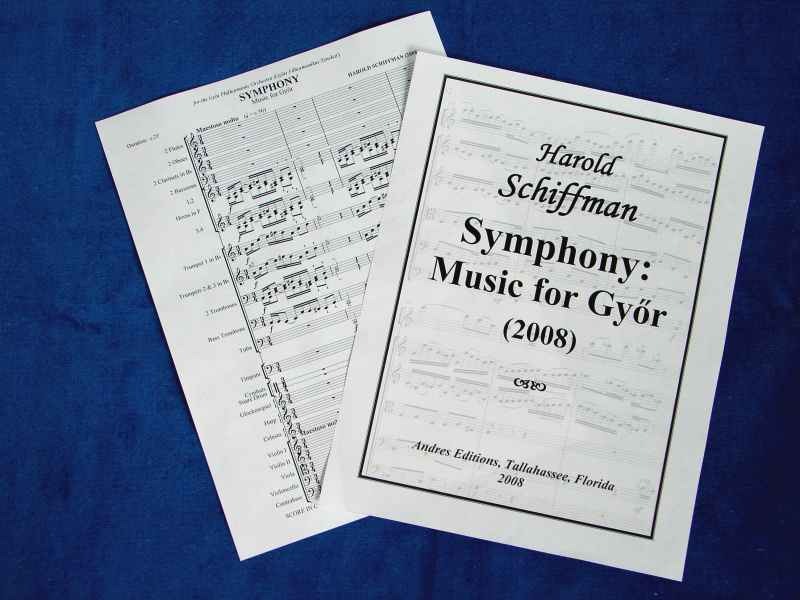 The collection contains approximately one hundred scores of music written by Harold Schiffman from 1944 to 2009. They include orchestral works, ensemble works, piano, harp, and harpsichord pieces, vocal works and songs, and chamber works. The Egon Wellesz Contemporary Music Collection consists of music scores, books, programs, correspondence, and other documents originally owned by composer Egon Wellesz (1885-1974). The bulk of the collection was donated to UNCG University Libraries' Martha Blakeney Hodges University Archives and Special Collections by Dr. Harold Schiffman and Jane Perry-Camp in 2009. Additional materials were donated by Julia Rosenthal. Egon Wellesz was an Austrian-born British composer, teacher, and musicologist who composed over 125 works in a variety of performance media. Wellesz was a student of composer Arnold Schoenberg and his collection contains many of Schoenberg's published works. David Gwynn, Digital Projects Coordinator, also notes that “the materials in the Wellesz collection are interesting not only for their musical content but also as examples of early twentieth century graphic design." Harold Schiffman at 80! (N/S R 1053). Critic Robert Schulslaper wove together the variety of contents in the two recordings – the contents of each recording, while treated separately, were simultaneously treated in such a way that Schiffman's compositional style and musical content were the clear and shared focus of his remarks about both CDs. Indeed, Mr. Schulslaper grasped and expertly expressed the very heart and meaning, while diverse in detail, of Harold Schiffman's full range of musical output. Starting with his comments about the cover of the Harold Schiffman at 80! recording, the discerning Mr. Schulslaper found the subtleties of Schiffman's style that brought together a folksiness with a strongly "sophisticated" grasp of the totality and structure of music and of music's varied meanings and means of communication, be they serious or humorous. Mr. Schulslaper clearly has a vast knowledge of and understanding of the musical repertoire from both the past and the present, and he uses that knowledge not to glorify himself, but to express the depth he found in Schiffman's work. Perhaps the critic's closing statement best serves his large view and his grasp of the essence of Harold Schiffman's music. This concise remark brings together his thoughts and projects them to the reader in a single straight-forward statement: "Summing up, Schiffman is a versatile composer whose talent is apparent in whatever idiom he chooses to express his very musical personality. Definitely worth hearing." 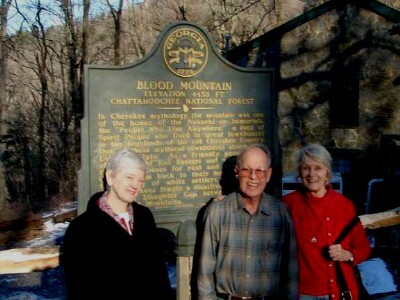 On 23 February 2010, Harold Schiffman's song cycle Blood Mountain (2007) was given its North Carolina première at the invitation of the University of North Carolina at Greensboro School of Music. The performance honored Harold Schiffman as the special guest composer who joined the University of North Carolina at Greensboro's composition faculty in their annual Faculty Composition Concert. 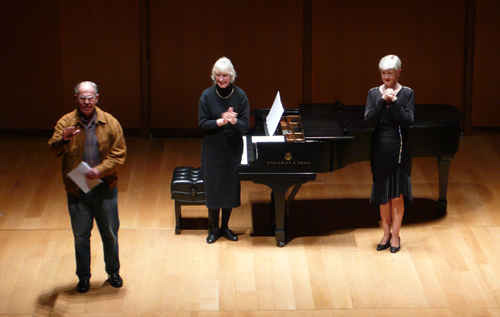 Soprano Gayle Seaton, for whom the song cycle was written, and pianist Jane Perry-Camp performed the work for the audience in the School of Music's Recital Hall. This was the cycle's second performance by the two artists, who presented its world première in the Gilder Lehrman Hall of The Morgan Library & Museum in New York City on 9 March 2008. The song cycle's Prologue and succeeding six movements were set to text from Black Shawl, a volume of poetry by Kathryn Stripling Byer, Poet Laureate Emerita of North Carolina -- a text whose setting in the North Carolina mountains was equally sensitively and appropriately matched by Schiffman's musical treatment of it. "THANK YOU so much for participating in our Faculty Composers Concert last night! I found your piece, Harold, to be intense, moving, and very beautiful. Jane and Gayle, your performance was riveting. I am really pleased we were able to include Blood Mountain on the program." The audience showed every sign of agreeing with composer Engebretson's assessment. 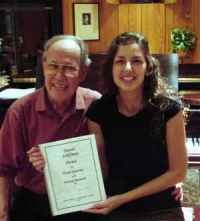 It might be noted that Schiffman's presence as a composer is recognized by the same university in the establishment of the Harold Schiffman High School Composition Competition, an annual award created to help promising young composers further their training and their success as composers. Scholarship assistance is awarded to the distinguished student winner of the competition. To celebrate the composer's 80th birth year, North/South Consonance presented a special program to honor Harold Schiffman on 9 March 2008 — an all-Schiffman concert in the Gilder Lehrman Hall of The Morgan Library & Museum in New York City. This recording offers the compositions heard at that concert, recorded in the same order in which they were heard on that concert, and by the same musicians who had performed them in New York. The photographs accompanying the musicians’ biographies in the CD's booklet were all taken during that concert. These musicians from the March performance gathered again in January of 2009 to make this permanent record of the music heard in New York. One may sense in these works Schiffman's purely human "laid back" style, as if pickin' and grinnin' in the North Carolina mountain tradition on the porch of his mountain house. Even Schiffman's melodic contours are frequently reminiscent of that same Appalachian mountain tradition, as one of Schiffman's mentors, Roger Sessions, pointed out: melodies starting high, and thereafter descending. As may be suggested even within that melodic descent, not all is happy and "laid back," for one can also find in Schiffman's music a serious, even tragic, feeling reflective of a loneliness and at times a melancholy that can be part of the lives of those who have inhabited and do inhabit those mountains, lives not without peril. The full range of human experience is offered in the music, as in the beautiful mountains. 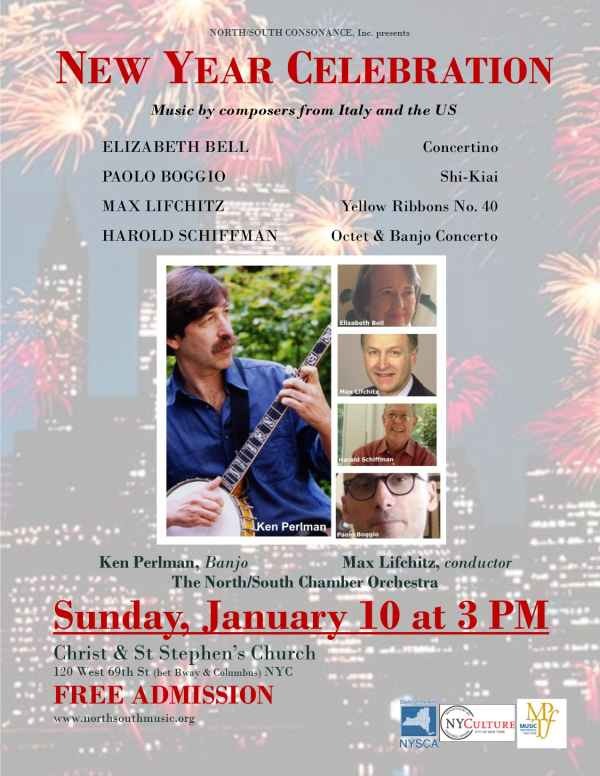 The year 2009 brought two new instrumental works from the pen of Harold Schiffman: one a concerted piece for ten instruments and the other a concerto for banjo and orchestra. The Serenata Concertante (2009) is for a chamber ensemble consisting of a wind quintet and a string quintet. 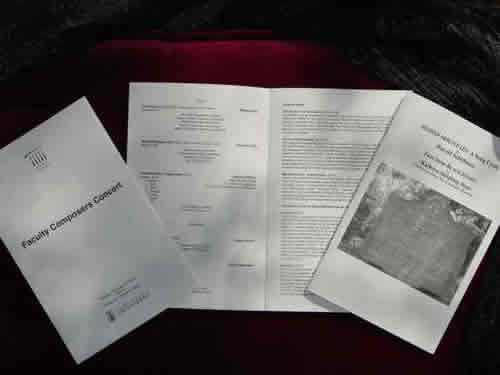 Commissioned by Max Lifchitz and the North/South Consonance Chamber Orchestra to celebrate North/South Consonance´s Thirtieth Season, the four-movement work was completed on April 9, 2009 in Tallahassee, Florida. Serenata Concertante (2009) joins other works written for the North/South Consonance Chamber Orchestra, such as Schiffman's Sestetto Concertato (1993), Chamber Concerto No. 2: In Memoriam Edward Kilenyi (2000), and Concertino for Flute and String Orchestra ( 2004). The new work will be premièred in New York City on 18 May 2010. Schiffman's Concerto for Banjo and Orchestra (2009) was written for the internationally acclaimed banjoist Ken Perlman. The orchestra consists of strings and woodwinds (the latter, one player to a part). The Concerto's traditional three-movement format opens with an Allegro molto movement, followed by a Lento movement, and concluded with a dance marked Vivace. The work was completed on August 23, 2009 in Graham County, North Carolina. Harold Schiffman with banjoist Ken Perlman. Not only is soloist Ken Perlman known for his virtuosity on the clawhammer banjo, but he is also regarded as the leading collector and archiver of authentic Celtic fiddle tunes in their purest forms, as can be found on Prince Edward Island in Canada, where they have been preserved since their arrival from their homelands across the Atlantic. 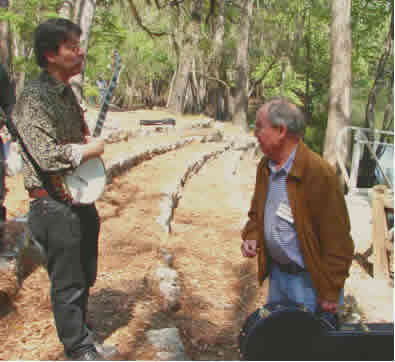 Too, Ken Perlman is known as a teacher of "old time" clawhammer banjo, as is evident from his writings (with instructional CDs in addition to his performance CDs) and from the number of his international workshops and classes, as well as the summer banjo camps he has founded and directs throughout the United States. The banjo tablature for the concerto's solo part is edited by Ken Perlman. a small, gilded gramophone statuette. Since first awarding the honor in 1958, The National Academy of Recording Arts & Sciences (aka NARAS or The Recording Academy) has voted each year to select that year's Grammy Award winners. No matter the final results, it is a clear honor for one's work to be proposed to represent some of the year's most "outstanding achievements in the music industry." 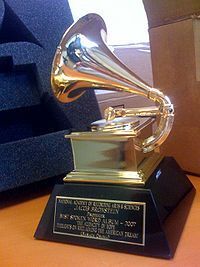 Further details may be found on various websites, such as http://en.wikipedia.org/wiki/Grammy_Award from which some data provided here were obtained. interview for its 3 April 2009 broadcast. The Florida State University's classical music station, WFSQ-FM, broadcast on Friday, 3 April 2009 a two-hour program of Harold Schiffman's compositions, interspersed with the composer's introductions of the works being broadcast. Host Dan MacDonald set the "stage" for the broadcast as if taking place on the porch of a mountain home, replete with rocking chairs. Mr. MacDonald's conversation with the composer (and briefly with Jane Perry-Camp, the pianist in two of the works aired) was succinct but casual. The works broadcast were Overture to a Comedy (1983); Symphony No. 2: Music for Győr (2008); Fugue and Postlude No. 12 from Spectrum, My Ladye Jane's Booke (1992); Concerto for Piano and Orchestra (1982); Blood Mountain Suite for Orchestra (2008); and Concerto for Violin and Orchestra (2006). 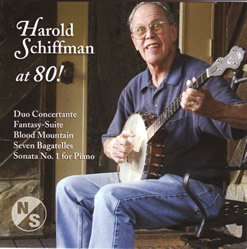 As of April 1, all North/South Recordings featuring Schiffman compositions are available for streaming and downloading at http://www.classicsonline.com/composerbio/Harold_Schiffman/. Commencing June 1, 2009, the Naxos network will distribute all of North/South Recordings' new releases throughout the United States, Canada, and Latin America. 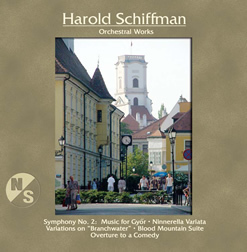 That distribution will include Schiffman's most recent release: N/S R 1050, Harold Schiffman: Orchestral Works, a CD that had been selected as a "Featured Addition" among the highlighted albums recently added to Naxos Music Library (http://www.naxosmusiclibrary.com). With North/South Recordings having joined Naxos' group of other leading independent labels, accessibility to all ten of Schiffman's CDs recorded (to date) on that label will widen exponentially and be readily available for listening and downloading internationally through Naxos' ClassicsOnline. In fact, word has already come in that Harold Schiffman: Orchestral Works has been discovered on the Naxos website in Hungary -- without any prompting from the USA! As a reminder, all the North/South CDs remain available through the North/South Recordings web site (http://www.northsouthmusic.org) and other retail web sites (Amazon, Barnes & Noble, Arkiv, etc). In Europe, the CDs are still being distributed through the Swiss Musiktraum (N/S R). The full effect of Naxos' distribution and availability of Schiffman's music on North/South CDs will mean that his music will be heard farther and wider than ever before, along with the public's enjoyment of it! 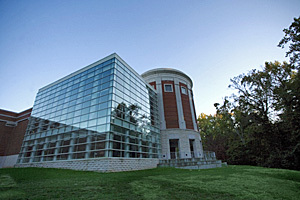 On February 20, 2009 The Harold Schiffman Archive was officially established at the Walter Clinton Jackson Library of the University of North Carolina at Greensboro. The donation of that archive coincided with the donation by Harold Schiffman and Jane Perry-Camp of the Egon Wellesz Contemporary Music Collection, obtained through the aegis of London's Otto Haas (established in 1866 as Leo Liepmannssohn), the renowned antiquarian bookseller. 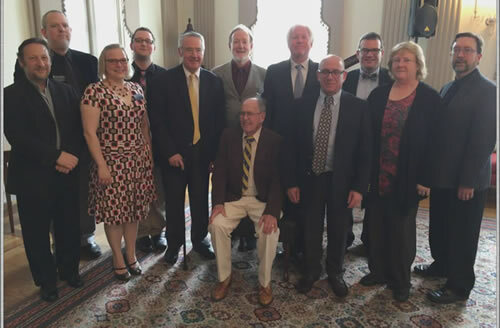 That company's proprietor Julia Rosenthal was present at the joint celebration of the Schiffman Archive and Wellesz Collection as the Library announced the receipt of those gifts. The donation of the Wellesz Contemporary Music Collection was made in memory of Albi and Maud Rosenthal, and in honor of Julia Rosenthal, daughter of Albi and Maud. 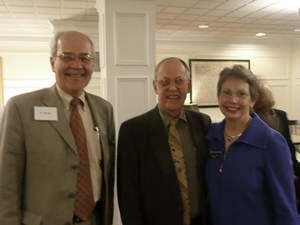 Not only did Ms. Rosann Bazirjian, Dean of University Libraries at UNCG, and her staff attend the celebration, but also Dr. John J. Deal, Dean of the School of Music, and notably Dr. Linda P. Brady, Chancellor of the University of North Carolina at Greensboro. 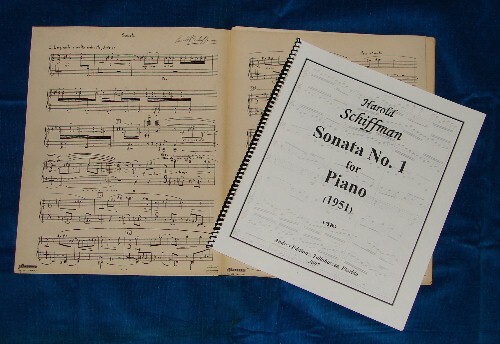 The Wellesz Collection presently contains over 70 items; the Schiffman Archive consists of copies of nearly all the scores that the composer has written – so far – which number over 90 items with more on the way. 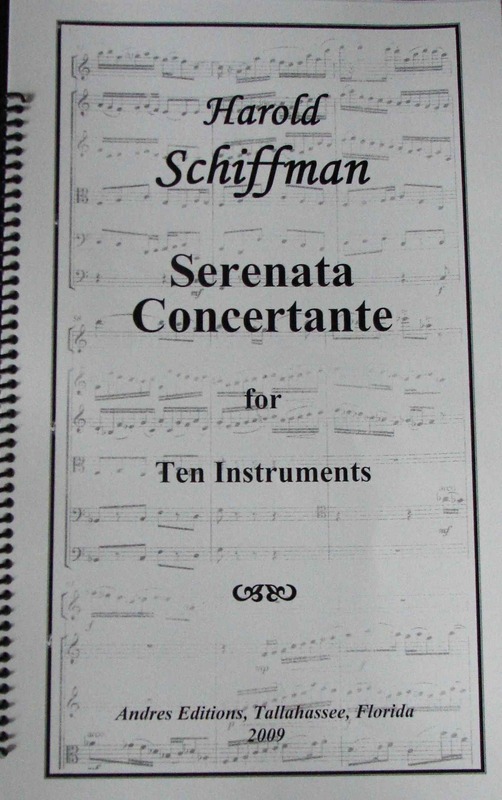 Schiffman's works yet to be written will join those presently in the Archive, as ultimately will his sketches and personal library including books, scores, and recordings. Newly released in December 2008 is the North/South Recording Harold Schiffman: Orchestral Works (N/S R 1050). Contained are the recordings made during October 2008 in Győr, Hungary – all by the Győr Philharmonic Orchestra under conductor Mátyás Antal. Recent works included are Schiffman's Symphony No. 2: Music for Győr (2008), as well as his new Blood Mountain Suite (2008), the latter being essentially an arrangement for symphony orchestra of the song cycle Blood Mountain (2007). Joining these new works are three older orchestral works: Variations on "Branchwater" for Guitar and Orchestra (1987), a concerto written for guitarist Stephen Robinson, and performed here by the young Hungarian guitarist, Katalin Koltai. Two shorter orchestral works complete the CD: Ninnerella Variata (1956) (Varied Lullaby), written in honor of the composer's then eighteen-month-old son Roger; and finally (as if positioned ironically), Overture to a Comedy (1983) brings the CD to a colorful close. This overture was written for Schiffman's yet incomplete opera based on novelist James Branch Cabell's Jurgen (for which opera two arias were written for and performed by soprano Gayle Seaton in 2003, in the Weill Recital Hall of Carnegie Hall, New York). Newscaster: The Győr Philharmonic Orchestra is preparing for a Hungarian as well as European première. As part of their Raiffeisen-Franz Liszt series they will perform Harold Schiffman's cantata titled Alma on Thursday, 16 October. The eighty-year-old American composer is visiting Győr for the seventh time, also to make, in addition, recordings of several orchestral works with the Győr Philharmonic Orchestra. During the last few days they have recorded Mr. Schiffman's Symphony No. 2: Music for the City of Győr, an orchestral piece dedicated to our city. Overdub: Harold Schiffman's music is harmonious-sounding but at the same time full of energy, with characteristic forms and rhythms, and with a sensation of temporal flow and progression. His cantata titled Alma will be performed by the Győr Philharmonic Orchestra and the Hungarian National Chorus, featuring the soloists Orsolya Sáfár (soprano), Katalin Halmai (mezzo-soprano), József Csapó (tenor) and Viktor Massányi (bariton) on Thursday night at the Richter Hall. * The piece was dedicated to Mátyás Antal conductor, chorusmaster of the Hungarian National Chorus. Schiffman: I was mainly inspired to write this piece for Mátyás Antal. The texts of the cantata, written for orchestra and chorus, were based on poems about the mountains of North Carolina. I enjoy returning to Hungary and to this area especially as the countryside around Győr is very similar to where I come from: rural but beautiful. Newscaster: During his two weeks in Győr, the composer is not only preparing for the concert but is also supervising the CD recordings the orchestra is making of his music. His Symphony No. 2, Music for the City of Győr is being recorded at this time. The composition is a commemoration of Mr. Schiffman's ten-year love affair with the city of Győr as well as its fine orchestra. * A second work joined Alma on the program. 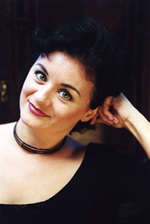 Of the soloists listed, only mezzo-soprano Katalin Halmai is a soloist in the performance of Alma. Symphony No. 2, titled Music for the City of Győr, was recorded in our city on Thursday. The composer Harold Schiffman studied under Ernő Dohnányi (Ernst von Dohnányi) in the mid-20th century, and afterwards became his colleague. After the recording session, the Győr audience had the pleasure of hearing Schiffman’s cantata titled Alma, a Hungarian as well as European première in the Richter Hall. ceremony's colorful backdrop displaying the City's Coat of Arms. 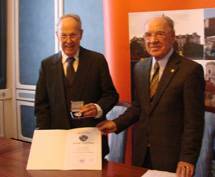 In the name of the City of Győr, Dr. Viktor Németh, Chairman of the Committee for Education, Culture, and Sports, and representing City Hall, greeted Composer Harold Schiffman on the occasion of his eightieth birthday this Thursday at the City Hall. 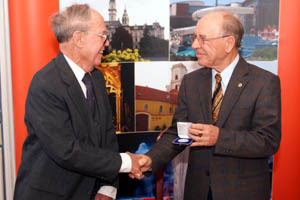 Mr. Schiffman was awarded the City's Silver Medal for all the work he has done for Győr's musical life and for increasing our city's reputation. In the past ten years Harold Schiffman has visited Győr seven times to record his music with the Győr Philharmonic Orchestra. His Symphony No. 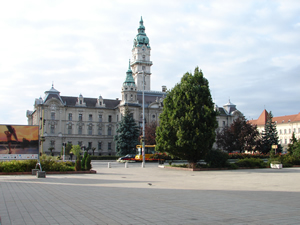 2: Music for Győr is his tenth orchestral piece to be recorded here. Mr. Schiffman said he first came to our city 27 years ago, stopping by for lunch only, but for the past ten years he has been a returning visitor of Győr. He said that the Győr Philharmonic Orchestra is his favorite orchestra, which, four years after recording it, is premièring Schiffman's cantata titled Alma on October 16. Alma's European and Hungarian première starts at 7 pm tonight in the Richter Hall. The composer was greeted by Dr. Viktor Németh, Chairman of the Committee for Education, Culture, and Sports. As he said, it fills our City with pride that he keeps adding to the richness of Győr’s cultural life and increases its reputation around the world. 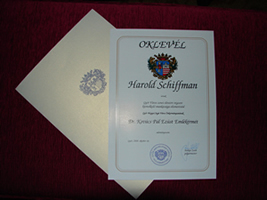 Mr. Schiffman was awarded the Dr. Pál Kovács Silver Medal this Thursday at the City Hall. The composer expressed his gratitude for the recognition and acknowledgement. He remembered how he first visited Győr twenty-seven years ago, just for a brief lunch at the railway station then. The true relationship started ten years ago, and he confessed that he loved our city very much, and that the Győr Philharmonic Orchestra was his very favorite orchestra. Mr. Schiffman turned eighty this year. He studied composition at the University of North Carolina and at Berkeley. Among his teachers the greatest influence on him was the Hungarian composer and pianist Ernő Dohnányi (Ernst von Dohnanyi). He studied under him for two years between 1957-59, and the two then became colleagues for another year, until Dohnányi’s death. Schiffman claims he inherited new musical thoughts as well as Hungarian traditions from his master. He takes his “credo” from Dohnányi: " No matter what else the music may do, it should always be beautiful". This is the seventh occasion in the past ten years that Mr. Schiffman has come to Győr, with the aim of making orchestral recordings of his pieces, as organized by the Kiraly Music Network. His Symphony No. 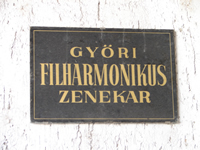 2: Music for Győr is his tenth orchestral composition to be recorded with the Győr Philharmonic Orchestra. All the pieces having been recorded here have been released on CDs in the United States. 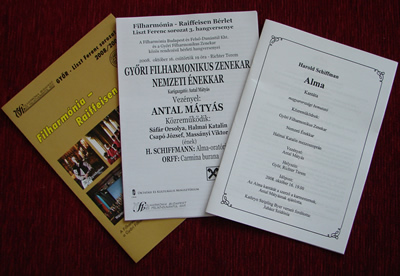 The CD leaflets always include nice and detailed descriptions of the Győr Philharmonic Orchestra, thus making their name better known around the world. Music critics have written internationally in praise of these recordings, all of which have been done with conductor Mátyás Antal, bearer of the Liszt, Bartók and Pásztory Prizes. At 7 pm on October 16 the Richter Hall will host a special event: four years after making a recording of it, the Győr Philharmonic Orchestra along with the National Choir is giving a European and Hungarian première of Harold Schiffman’s cantata titled Alma. The piece was written for and dedicated to the conductor Mátyás Antal. 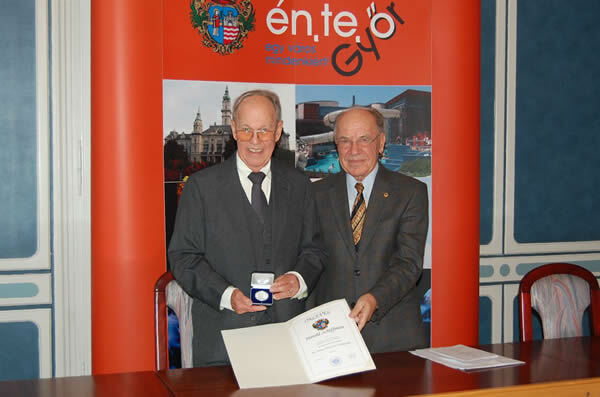 "Mindegy milyen a zene, gyönyörűnek kell lennie"
Dr. Viktor Németh, Chairman of the Committee for Education, Culture, and Sports, and representing City Hall, awarded composer Harold Schiffman the City’s Silver Medal this Thursday at the City Hall. The composer, who turned 80 this year, has come to Győr for the seventh time to make a CD recording. His Symphony No. 2: Music for the City of Győr, is his tenth orchestral piece to be recorded by the Győr Philharmonic Orchestra. All of Mr. Schiffman’s works recorded so far have been released on CDs in the USA. Thursday night at the Richter Hall the orchestra premièred his cantata titled Alma, which was written for and dedicated to conductor Mátyás Antal. * Comment by Ernő Dohnányi (Ernst von Dohnányi), as quoted by Harold Schiffman. A hearty welcome to our new Hungarian visitors! We are delighted to add the Hungarian versions of our website's Home, Biography, News, and, in part, Reviews pages -- pages which are accessed by the Hungarian flag icon found on the Home page. These pages are offered in honor of the Győr Philharmonic Orchestra and the City of Győr, and of that fine orchestra's presentation of the European première of the cantata Alma on 16 October. 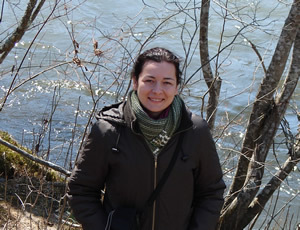 Our special thanks go to Szidónia Juhász who created the superb translations of the English texts into Hungarian. WELCOME! And do come visit us again! Viszontlátásra! 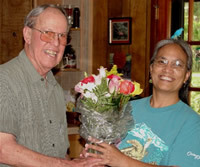 On 16 September 2008, Dr. John J. Deal, Dean of the School of Music of the University of North Carolina at Greensboro (UNCG) presented to Freshman composer James Lego the inaugural award of the Harold Schiffman High School Composition Competition, an award open to any graduating high school student in North America whose compositions are deemed by the UNCG School of Music's composition faculty to be deserving of the award and the monetary stipend accompanying it. James Lego hails from Suffolk, Virginia, and is a graduate of King's Fork High School. He was born on 16 September 1990 and thus celebrated his eighteenth birthday in a very special manner! He had ventured into several creative fields before pointing himself towards his promising future as a composer. Already in his list of compositions are large works for chorus and instrumental chamber works, as well as symphonic works for full orchestra. Currently he continues to write both instrumental and choral compositions. Besides composing, his activities include both vocal and instrumental (piano) performance -- and acting (plays and musicals) as well as writing poetry, all of which attest to his earlier versatility of interest and talent. His current studies at the University of North Carolina at Greensboro lead to his earning the Bachelor's Degree in Music. As part of the March 2008 celebrations of Harold Schiffman's 80th birth year, three of his works received premières. On March 1, the University of North Carolina at Greensboro presented an all-Schiffman concert that featured the North Carolina première of his cantata Alma (2002). Welborn Young conducted the performance, with mezzo-soprano soloist Hope Fairchild Thacker, and the UNCG Chamber Singers, the UNCG University Chorale, and the UNCG Faculty and Student Orchestra. 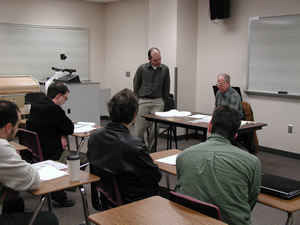 During the days prior to the concert itself, the composer worked with various composition students in the UNCG School of Music, offering them both a seminar and a masterclass. The birth year celebration continued in New York, at The Morgan Library & Museum, where Schiffman's song cycle Blood Mountain (2007) received its world première. Like Alma (which text was from Wildwood Flower), Blood Mountain was also set to text by North Carolina Poet Laureate Kathryn Stripling Byer, from her volume of poetry, Black Shawl. Soprano Gayle Seaton, for whom the cycle was written, and pianist Jane Perry-Camp presented the work to the Gilder Lehrman Hall audience. 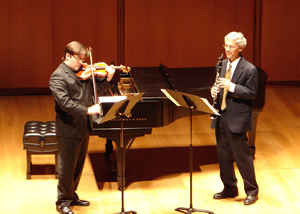 Likewise receiving its world première during the concert was Schiffman's Duo Concertante for Violin and Clarinet (1993), performed by violinist Aaron Boyd and clarinetist Richard Goldsmith. Additionally, violist Ah Ling Neu gave Schiffman's Fantasy-Suite for Solo Viola (1980) its first New York performance; just as pianist Max Lifchitz gave Schiffman's Sonata No. 1 for Piano (1951) its first New York performance. official orchestra of Győr: 1894. Nearly forty-seven years after composing his first symphony, Symphony (1961), in Tallahassee, Florida, on February 6, 2008, Harold Schiffman has finished his second. Scheduled for recording by the Győr Philharmonic Orchestra with Mátyás Antal conducting, in October, 2008, the work is a paean commemorating the composer's ten-year love affair with the city of Győr, Hungary, and its glorious orchestra. Symphony No. 2 (2008) thus is subtitled Music for Győr. are but a short walk from the János Richter Hall. Coinciding with his 80th birth year, Harold Schiffman's cantata Alma (2002) will receive, in Győr, Hungary, its European première in a performance by the Győr Philharmonic Orchestra and the Hungarian National Chorus, Mátyás Antal (for whom the work was written) conducting. The première is scheduled as part of the orchestra's regular subscription series. Mátyás Antal's recording of Alma (North/South Recordings), released in 2004, has drawn high critical praise. 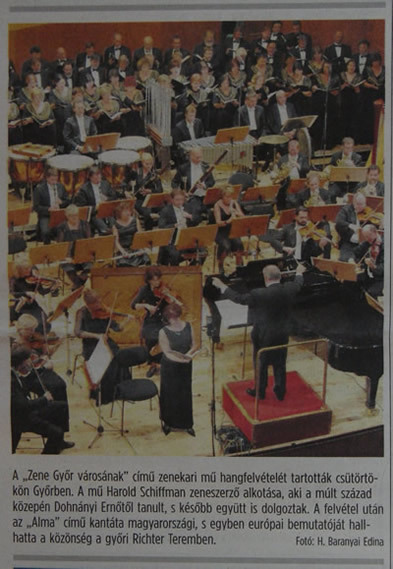 The concert will take place the evening of Thursday, 16 October 2008 in Győr's János Richter Hall. The composer plans to attend. in an entryway into the orchestra's home, the János Richter Hall. * Győr's roots can be traced at least to the Celtic invasions in the 5th century B.C., if not to the Bronze Age; digging deeper into the murky past, some sources suggest that Győr may have been settled as early as the 3rd millennium B.C. when the Celts were moving into Hungary. Debreczeny, Miklós. Miért szép Győr? (Why is Győr Beautiful?). Historical consultation with and confirmation by Gyula Perger. Translated (into English) by Tamás Czuczor. Publication: Nyomdai munkák - Prospektus Nyomda. N.p., n.d. 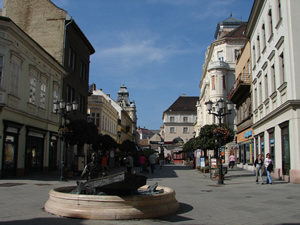 The Tourist Committee of City Győr. Pocket-Guide to Győr: City of Encounters. English version. Translated by Dr. Norbert Pesztenlehrer. Győr: Gábor Horváth, 1999. To celebrate his 80th birth year, two all-Schiffman concerts are scheduled for March 2008 (although his birthday is not until August!). University of North Carolina at Greensboro. On Saturday, 1 March 2008, at 7:30 P.M. in the School of Music Recital Hall, the University of North Carolina at Greensboro will feature Schiffman's compositions in a performance of various works including the North Carolina première of his cantata Alma (2002). Other works will feature chamber and solo performances by various artists, most of whom are members of the faculty of the School of Music. It is expected also that the first winner of the Harold Schiffman High School Composition Competition Award will be announced at the concert. On Sunday, 9 March 2008, at three o'clock in the afternoon, North/South Consonance will sponsor a program of chamber music in New York City's new Gilder Lehrman Hall of the J. Pierpont Morgan Library and Museum (at Madison Avenue and 36th Street). 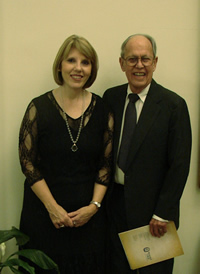 This all-Schiffman concert will not duplicate any of the compositions heard in the Greensboro concert; instead, among other works, it will feature two world premières: Schiffman's song cycle Blood Mountain (2007), using text from Kathryn Stripling Byer and featuring soprano Gayle Seaton, for whom the cycle was written; and his Duo Concertante for Violin and Clarinet (1993). 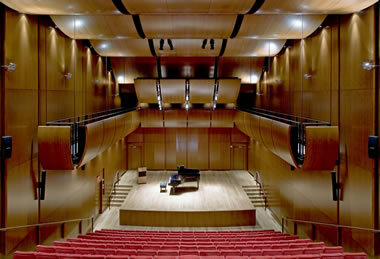 Featured also will be a performance of Schiffman's early Sonata No. 1 for Piano (1951). 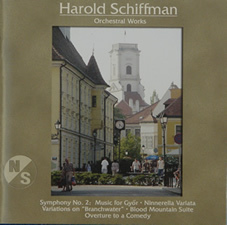 During September 2007, three of Harold Schiffman's concerti - his Concerto for Violin and Orchestra (2006), his Double Concerto for Horn, Bassoon and String Orchestra (1992), and his Concerto for Violoncello and Orchestra (1979) - were recorded in Győr, Hungary with the Győr Philharmonic Orchestra (Győri Filharmonikus Zenekar), Mátyás Antal conducting. 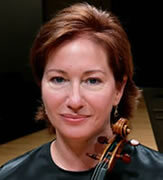 Rebekah Binford, for whom the Violin Concerto was written, is the soloist in "her" concerto. She is the Assistant Concertmaster of the North Carolina Symphony. 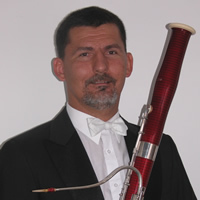 Soloists for the Double Concerto are Tamás Zempléni, French horn; and Pál Bokor, bassoon - both of whom are members of the Hungarian National Philharmonic Orchestra. The Violoncello Concerto features Ákos Takács, 'cellist of the Auer Quartet, which had recorded Schiffman's string quartets in 2004. The compact disc of the three concerti was released as N/S R1047 by North/South Recordings in December, 2007. North/South Recordings has just released its newest compact disc, N/S R 1045, Remembrances|Recuerdos: Music by Composers from Cuba and the US. The disc includes Harold Schiffman’s Concertino for Flute and String Orchestra (2004) performed by Lisa Hansen, flutist, and the North/South Chamber Orchestra, conducted by Max Lifchitz. The work was written to celebrate North/South Consonance´s twenty-fifth season, and was premièred in New York City, January 9, 2005, by the same performers. 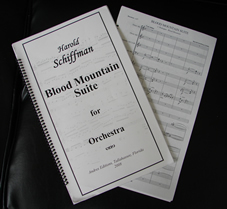 Harold Schiffman's song cycle, Blood Mountain (2007) for soprano and piano, was completed in Graham County, North Carolina, June 20, 2007. 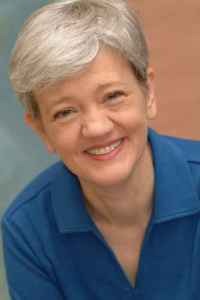 Written for soprano Gayle Seaton, Director of the Music Theatre program at the Florida State University, the work takes its text from North Carolina Poet Laureate Kathryn Stripling Byer's book Black Shawl. 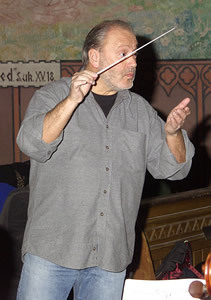 Seaton has performed a number of Schiffman's works including Four Songs from Peacock Pie (1983) and Anaïtis's Seduction Aria and Farewell (2002). 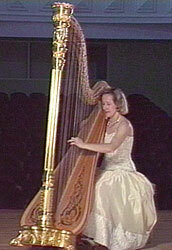 She premièred the latter piece in New York's Weill Recital Hall at Carnegie Hall March 10, 2003. P. O. BOX 5433, BLOOMINGTON, IN 47407 USA. in original manuscript and now in print. Added to Harold Schiffman's catalogue of works is his Concerto for Violin and Orchestra (2006), written for Rebekah Binford and completed in Graham County, North Carolina, on December 3, 2006. Binford is Associate Concertmaster of the North Carolina Symphony. She has premièred a number of Schiffman's works including Duo Concertante for Violin and English Horn (1990) and Sonata for Solo Violin (1993), a piece written for her. The new concerto features an important role for the harp as well as prominent parts for various woodwinds and French horns. The Violin Concerto is available from Harold Schiffman/Andres Editions. The distinguished and world renowned banjo maker, OME Banjos, has recognized and honored Harold Schiffman by including him in their gallery of OME artists. 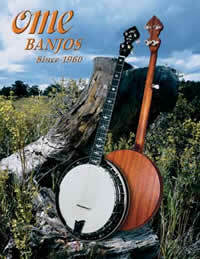 Please visit the OME Banjo site at http://www.omebanjos.com and click on Gallery. It is a special pleasure to announce that the generosity of an anonymous donor has made it possible for The School of Music of The University of North Carolina at Greensboro to establish The Harold Schiffman High School Composition Competition Award. 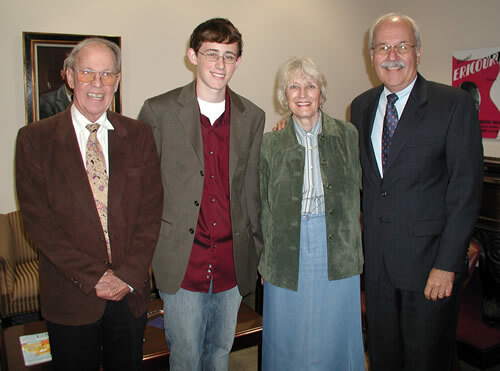 The Award not only honors its namesake but will provide both encouragement and support for young composers to explore their talent and to hone their skills in writing music - opportunities that will be available to them as undergraduates in The School of Music at The University of North Carolina at Greensboro. The Harold Schiffman High School Composition Competition will be open to high school seniors who desire to pursue their undergraduate music study in composition in the University of North Carolina at Greensboro's (UNCG's) School of Music. It is expected that the first Award will be given for the 2007-2008 academic year. When each Award is announced, the recipient's name will appear on this web site, on the "News" page, along with our congratulations. WELCOME TO HAROLD SCHIFFMAN´S WEB SITE! It, of course, should come as no surprise that the web site is now up and running, since were it not so, you´d not be reading this message. Still, it is exciting to welcome it into the world, cyber though that world may be. I hope that you´ll find the web site useful, informative, and even at times entertaining. It will be my pleasure, and that of my webmaster, if you find it to be so! The world hasn´t enough gratitude to extend adequate thanks to Elsa Leslie, who undertook the task of designing and literally mastering the web site. She has the patience of Job in dealing with my ignorance, uncertainty, and sometimes downright goofiness – yet she took it all in stride and never showed the slightest sign of impatience (although I´m sure that I caused her eyes to roll heavenward many a time during the process of creating this web site). For years my wife and I have known her to be a brilliant programmer and dear friend. 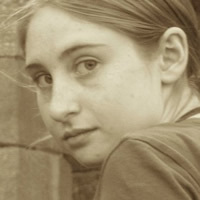 Now we know her to be likewise a brilliant webmaster – and (thankfully) still a dear friend! So, thanks, Elsa, for working a miracle – a miracle that is made evident through the existence of your reading this very note right now: through the existence of www.haroldschiffman-composer.com! Perhaps, the feather in your cap, Elsa, is more literal than I had realized. Just look at one of your two photos on this page, and you´ll see that a little birdie had to chime in somehow or another. Of course, it is a bluebird – and seems to be just as happy as I am. AGAIN, WELCOME TO MY WEB SITE!